PRODUCTION EXPO 2014: Max Cooper has quietly garnered a reputation amongst those in the know for his beautiful, glitch-ridden EPs, stunning remix work and DJ sets. With the release of his brilliant debut album, Human, the number of people 'in the know' looks set to multiply exponentially and deservedly so. 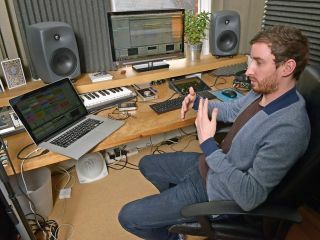 With a PHD in Computational Biology and a background working in genetic research, Max Cooper isn't your common-or-garden electronic dance producer. Human is his considered take on various elements that make up the human condition - a hypnotic journey that veers from the delicate arpeggios of album-opener, Woven Ancestry to the glitched-out beats and sonic-assault of tracks like Impacts or Seething. It's no over-statement to suggest that Cooper has produced one of the best albums of the year thus far and, with that in mind, we made the trek to North London to meet Max in his ergonomic nerve-centre where the digital magic happens, envelopes are generated and the CPU is punished. Beautiful music lovingly created with the appliance of science. Sublime album opener Woven Ancestry is incredibly fragile whereas later tracks like Impacts are speaker-bothering attacks on the senses. Is it important to you to have a varied sound palette? "Yeah, that's something I've always done on my productions and in my DJ sets. I love contrasts and maximising contrasts; it's the way that you can make the greatest impact. If you go to a club where every track is a huge banger then after 20 minutes they lose their impact, whereas if you're at a club where they're playing an hour of ambient music then they play a huge banger… It's that principle, really, of using contrasts to increase the effect you want of any given track. So, as you say, Impacts is this really heavy, abrasive, atonal thing and the track following it, Empyrean, is essentially a track about heavenly sorts of sounds so it's really relaxed with melodic strings." What led to your choice of hardware and software? "Well, my set-up's always been very, very sparse and for a long time I couldn't really afford much equipment so it was literally just a computer and a pair of monitors and I did what I could with that. I've sort of ingrained that approach in myself where I don't like buying any new musical equipment until I feel I've got the most out of what I already have. There are so many options available now in software, which is part of the reason I haven't delved too far into the analogue world as yet. I feel like there's still so much to learn with software and maybe it's a bit of my scientific background coming through but I like to explore all the possibilities before moving on to the next thing." With that infinite number of possibilities, how do you ever know when enough is enough on a track? "Well, I'd have to say that pretty much none of my tracks are finished, so it's never enough and it winds me up when I hear my own music and I can't stop thinking about all the things wrong or the things that need done to it. That's always the way. I think you maybe have to have that frame of mind to actually write music. You have to be self-critical and constantly analyse and seek to become better. If you ever hit the point where you think that you've done the perfect track or perfect album then where do you go from there?" "For a long time I couldn't really afford much equipment so it was literally just a computer and a pair of monitors"
You're a noted Ableton user. Does software like Live suit your workflow? "Yeah, Ableton's great. It's really easy to use and drag and drop intuitive. The great thing about Ableton is that they're constantly updating and developing Live. The amount it's changed over the last five to ten years is amazing. From something that was essentially a fairly basic performance tool it's become this huge, versatile music production software. With the addition of Max for Live, which I use a lot, it's opened up infinite doors. I use it in every track in terms of all the plug-ins that Max for Live provides or that you can download on the user database for Max for Live patches. "I haven't really got into the Max programming side. I'd love to do it but I just don't have the time. It's one of those things like a lot of my friends are into modular synths and they're such a brilliant way of opening creative doors but you can also easily get lost in it and spend all your time building these Max patches or modular synths and making crazy noises but never getting any tracks finished. I've always had a strong drive to finish music. Even though I'm never fully happy with things, I do have this drive to express myself musically. I don't like going too deep into the technical thing and becoming obsessed with that as I want to keep in touch with 'what can I actually communicate to other people through music?'. In order to do that I need to be able to hear music and think about it on a non-specialist level." Ableton's Operator is an important component of your sound. What else do you use? "Max for Live, as I mentioned. I use the API tools for Max for Live a lot. They open lots of doors for being creative. You can have an LFO, which you can assign to any parameter in Live or you can randomise parameters, which is really useful. So, you can randomise synth or sample parameters and get interesting generative modulation happening. A lot of my production, for example the track Impacts, is about setting up these randomised parameters then recording and rendering a randomise process, which I then go back to and pick out the good bits. You're looking for fortuitous mistakes really. Throw a load of random, mad stuff and hopefully you'll find some really good bits within that." "[Ableton has] become this huge, versatile music production software"
Is there any other generative software that you use in your writing process? "I guess the one other thing is using the Lemur on the iPad as a control surface. With that, you can have all these bouncing balls, which control lots of different parameters and, again, you get some emergent behaviour coming from that because you have all these parameters, which, as the balls are bouncing around, there is a deterministic form although it's not easy to tell what that is. You've got lots of parameters following these complex paths then you get, to some degree, a generative result." Do you think hardware is back to stay after all the software revolution? "People argue about that all the time. There's no doubt that a lot of great music is made with analogue synths but it's also true that there's a lot of hype around analogue synths too. When people ask me what synths I use they're often surprised that, until the last few months, I haven't been using any hardware synths at all. There are a lot of producers out there who people think use analogue but they actually don't. It's not as simple as, if there's a fat synth sound then it must be analogue. You can do great music with analogue synths or with soft synths. I talked to my friend Gareth (Williams) from Liine about this and he thinks it's as much about how having a physical keyboard with all the knobs and controls makes you interact differently with the synth than with a soft synth. So, it's more about that physical interaction than about whether the filters sound a certain way. I think that's a good point." What soundcard and convertors are you using? "I'm using a basic Focusrite Saffire 6. That's one of the next things on the list as I really need to get an RME or something. Actually, the sound quality with the Focusrite has been decent. I've had a few different soundcards and it stacks up well against them. To be honest, I think the difference between soundcards is much smaller than the difference between a well-treated and a badly-treated room or bad monitors. I like the sound of the Genelecs. I used to have a pair of KRKs and I much prefer the Genelecs. Everyone has their own opinions on these things so I guess you have to just sit down, listen for yourself and make your own decisions about soundcards and monitors. Don't be too worried if someone thinks something different from you. If you can get good results then that's the bottom line." "There's a lot of hype around analogue synths"